In this review, we have the Shark ION robot R85, or RV850. We put it through a ton of tests. Let’s get started. So the R85 is basically the same robot that comes with the S87 package, which is basically the R85 robot with a W1 cordless vacuum included. The R85 is an upgrade from the previous version, the R75, which we’ve also reviewed. The big upgrade is with the power. Shark claims that the max power mode is three times more powerful than the R75. We tested the airflow in all three power settings and found that on max power, the R85 got a whopping 20 CFM of airflow. That’s 3 CFM more than even the most expensive Roombas, like the 980 or the i7, and it’s tied with the Neato D7 on its turbo power. So along with the Neato, the R85 is the highest airflow I’ve ever measured on a robot. 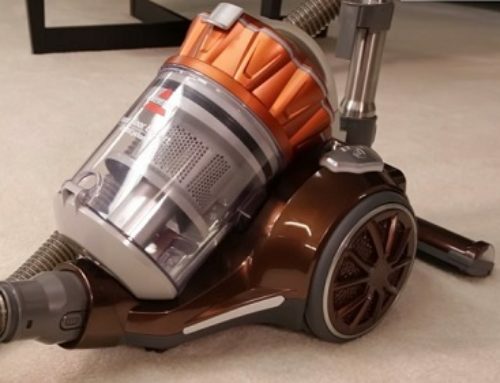 The next step down on the R85, the so-called normal power, was pretty good, too, at 15 CFM, and even its quiet mode, or low power, was still 2 CFM more powerful than the Roomba 690. So yeah, it has a lot of power. Its cleaning mechanics were very good. 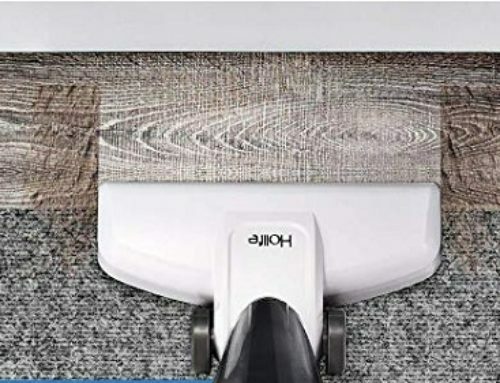 In addition to having a solidly built brush roll, which was a hybrid of standard bristles and rubber, it has a brush type airflow seal and two side brushes. On carpet, it picked up all the debris, including fine debris, pet hair, and large to extra-large debris even in its lowest setting. It does better with its two higher power settings on carpet, but it’s not that big of a difference. On hard floors, again, it does great even in its lowest power setting. I also liked how the two side brushes spin much slower than you typically see, which means they kick debris around a lot less than with the Roombas, which tend to be very messy. My only complaint with the pickup test is that while using max power on hard floors, the air from the exhaust tends to blow around debris that’s very light, like pet hair. We saw the same effect with the Roomba 690. However, unlike the 690, the R85 has three power settings, and we found that this effect was greatly reduced on its normal power mode and completely gone in it slow or quiet power mode. Generally speaking, robot vacuums are not known for deep cleaning carpets, but the Shark R85 scored 76% on our embedded sand in the carpet test, which is the highest score I’ve seen since we moved to this type of deep clean test. We still have four more robots to test in this series but I suspect the Shark R85 will end up near the top when it’s all said and done. 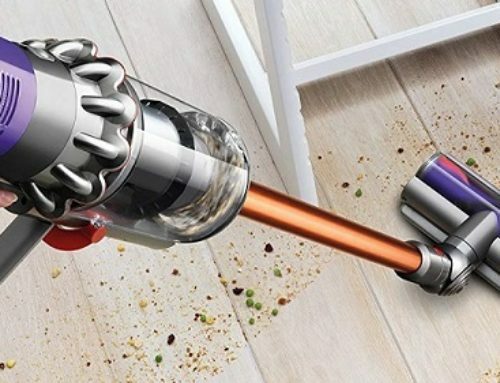 Like most vacuums in this series, it’s a standard navigation robot, meaning it bounces around more or less randomly until it cleans your home. It has a fairly smart algorithm, though, and it tends to cover the area fairly quickly, even with a lot of obstacles in the room. It has a really big dustbin which we measured at about two cups which is about double the size of the Roomba 690’s. I really think that big dustbins are important and the R85 has one of the biggest out there. It was easy to remove and sort of easy to empty, though it took me a few times to actually figure out how to open it properly. I like the two side sensors, which apparently detect objects so as not to bump into them too hard. You can see that it sort of slows down before it hits a wall or furniture which is more rare than you might think on a robot. Its edge cleaning was fairly good. It ended up only leaving a little bit in the corner. Basically an above average performance and it certainly beat the Roomba 690 in this test, which did horribly. It did better with the crevice pick up test than any robot I’ve ever tested, including the previous winner, the super high-end Neato D7. I’m guessing the various seals on the bottom as well as the high airflow gave the Shark R85 the advantage here. Just like the previous Shark ION robots, the R85 is incredibly quiet. It’s the quietest robot of the previous seven that I’ve tested at 61 decibels on max mode and it really didn’t change much on normal and even quiet mode, dropping only to 59 decibels. We tested its battery life and found that, on low power, it ran for almost an hour and a half, about 88 minutes, and on max power it ran for about 61 minutes, which is pretty good considering it’s putting out 20 CFM in max mode. We didn’t test its medium power but you can assume it would be somewhere in the middle of those two numbers. You can see from this chart that the R85 has fairly typical battery life numbers for a robot in this price range. I should also mention here that its battery pack is easy to remove and fairly cheap to replace. In fact, the inexpensive and easily accessible parts is a definite pro for the Shark R85. One cool thing is that the R85 actually cleaned black carpet, which most robots can’t do because of their cliff detection sensors which see the black carpet as a cliff. I’m not sure why the R85 can do this. In case you’re wondering, its cliff detection sensors work fine. In any case, kudos to Shark for fixing this issue. 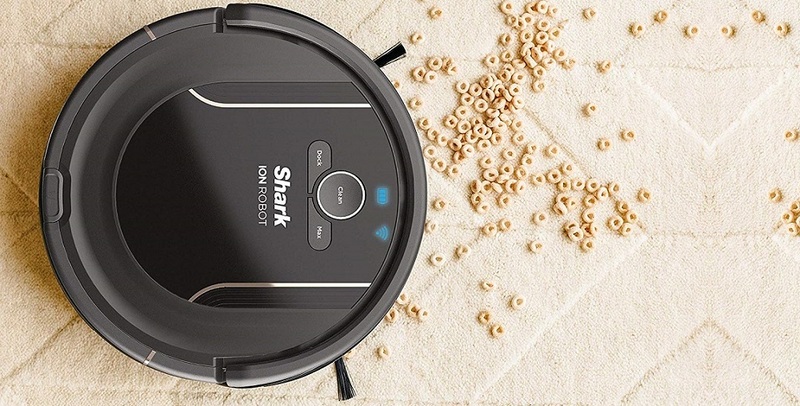 The Shark R85 has an unusually low profile at 3.4 inches which is shorter than the Roomba or the Neato by quite a bit and so it has no trouble getting under things. It’s also pretty good with climbing. It was able to climb three-quarter inches at 90 degrees with no trouble, which is rare. The app is pretty standard. You can schedule cleanings from anywhere. It has basic controls, like start, stop, find robot, return to base, and power level settings. You can also get alerts and see historical statistics. So the Shark ION R85 is crazy powerful. It has really good cleaning mechanics. It has a massive dustbin, decent battery life, it’s super quiet even at its max mode. It has amazing deep cleaning and edge cleaning. It’s pretty smart for a random navigation robot with sensors that add a lot of value. All in all, I wouldn’t be surprised if at the end of this series, the Shark R85 wins or at least makes the top three. It certainly is light years better than the Roomba 690.